In a communiqué made available to our reporter after an "extra ordinary" emergency meeting held on Saturday 6 April, by Umuezechieamalu family, kinsmen to Chief Hyacinth Udemba (Akamkposi Obosi) one of the allegedly suspended Ndi Ichie, and also the custodians of Eke Obosi which plays a significant role in the crowning of Obosi king, Ndi Ichie and other title conferments in Obosi, the kinsmen said after listening to the accounts of their two representatives at the Igwe's cabinet (Chief Charles Umolu and Chief Hyacinth Udemba) on the allegations that led to the purported suspension of their son Akamkposi Obosi from Igwe's cabinet as pronounced by one 'Prince Dr. Bennett Mozie' on behalf of Eze na Ndi Ichie Obosi at the Igwe's palace on March 23, 2019, the family is constrained to express their position. In the statement signed by the Chairmen and Secretaries of the kindred home and abroad - Mr. Obiora Arinze, Mr. Nonso Ilechukwu, Mr. Tony Arinze and Mr. Nzube Onunkwo, the kinsmen stated that "As the custodians of Eke Obosi which plays significant role in the making of an Eze, Ndi Ichie and other titles taking in Obosi; Umuezechieamalu family deserves some respect in dealing with issues involving it in the cabinet and Obosi." "We note with trepidation the practice of successive Eze Obosi to ridicule Ndi Ichie from our family. Obosi history recorded the humiliation of Chief J.S.B Orakwue (Ajee Ukwu), Chief Charles Umolu (Akpe Obosi) and now Chief H.N Udemba (Akamkposi Obosi). It is therefore painful that the only reward for the indispensible role played by our family in the crowning of an Eze Obosi has in recent times been impunity of arbitrarily suspending our Ndi Ichie without reference to the family being stakeholders in the kingship institution." 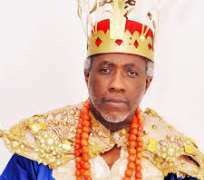 The family however insists that the alleged suspension will not see the light of day as it has been proven that the traditional ruler of Obosi lacked the powers to suspend or expel an Ndi Ichie title holder of Obosi, worse still the alleged suspension document was signed and pronounced by "a nonentity in Eze na Ndi Ichie relationship." "It is an irony that Rev. Bennett Mozie should assume a bogus title to announce a decision which was not contemplated by Ndi Ichie Obosi on whose behalf he signed." The statement read. The statement further states that it has been established that Ndi Ichie title holders in Obosi enjoy the immunity of Obosi revered custom and tradition (Ome abu nso) which exempts them from any wrong doing or committing any form of sacrilege within Obosi land. And even when any sacrilege is deemed to have been committed in Obosi by anyone, a particular kindred has the prerogative to declare the action an abomination or sacrilege. This same kindred is responsible for the performance of cleansing rites in Obosi. "It is therefore abominable for any other authority to declare any action a sacrilege except the custodians" "So the purported suspension of Akamkposi Obosi is therefore not acceptable to Umuezechieamalu family and we request it's immediate reversal and recourse to due process if needful"
Chief Udemba opined that though he would ordinarily not wish to comment on matters bothering on his community's tradition publicly, he stressed that it has become necessary to reveal some vital information as many people are unaware of the historical background of Obosi as an ancient kingdom, and the events that followed, even as falsehood and propaganda have become the order of the day. Chief Udemba maintained that he is not in anyway perturbed over the pronouncement "I am not perturbed in anyway, as the pronouncement was a reactive response of a frightened and fidgeting monarch." He said. While dismissing the exercise as a sham, Udemba recalled that the traditional leadership of Obosi is yet to come to terms on the type of Monarchy in place in Obosi. "Obosi is neither an absolute nor constitutional monarchy. And in the 3rd rank of monarchy, we may be ranked semi monarchy where the office of the monarch is donated by the composite members of the community. And to this end we have a crowned monarch who basically reigns with limited authorities. It is, however, evident that the urge for absolute monarchy most times lead to unnecessary actions that set the community at disparity most times, no wonder a change from His Royal Highness (HRH) to His Majesty (HM), usually assigned to monarchs that rule over conquered territories."